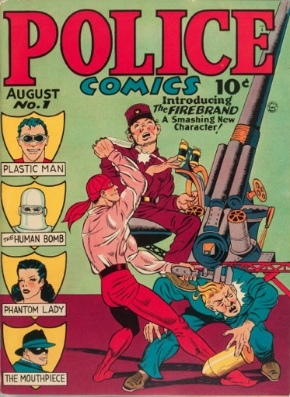 3-D Man was a hero composed of two brothers, Chuck and Hal Chandler. Chuck was a test pilot, and Hal was bookish and had been disabled in childhood by polio. Chuck is kidnapped by Skrulls, but gets away, crashing his experimental ship in the process. Hal attempts to rescue him, but Chuck disappears. Later, Hal realizes that Chuck has been turned two-dimensional by strange radiation he'd been exposed to on the Skrull ship, and that his image is imprinted on Hal's glasses. 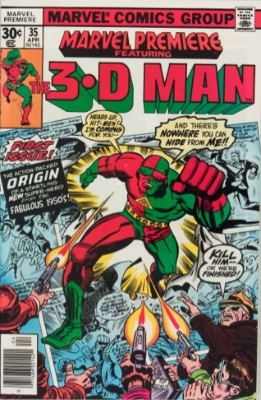 When Hal puts the glasses on and concentrates, Chuck's image merges with his body to form 3-D Man, a red-and-green superhero with tripled strength, speed, and stamina, who also has the ability to detect the presence of Skrulls. He has returned several times over the years. #711 was really Daniel Dyce, District Attorney. He was almost an exact double of an old friend of his, Jacob Horn, who was in prison. Horn wanted to get out to see his wife give birth to their child, so Dyce agreed trade places with him. Horn died in a car crash on the way to the hospital, stranding Dyce in jail, where no-one believes his story. He tunneled out of prison, but decided not to escape, instead choosing to leave the prison every night to fight crime, and then return to prison before morning roll call. He donned a suit, cape, fedora, and mask, and used the name #711, his prison number. He was killed after only two years. Now owned by DC Comics.